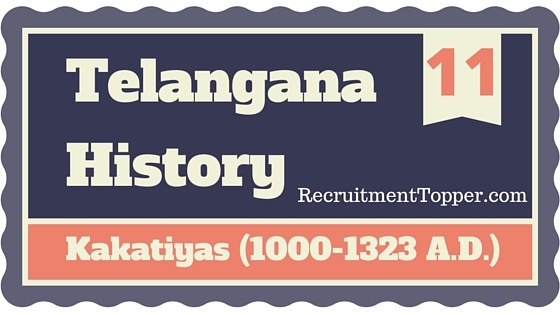 Kakatiya dynasty was one of the prominent rul­ing dynasties of Telangana. Kakatiyas not only ruled a very large kingdom, but also introduced a strong administrative system; were famous as generous and good rulers and extended their name and fame to for away regions. There are a lot of arguments about the origins of kakatiya dynasty. Kakatiyas were first mentioned in the Magallu inscription (950 A.D.), issued by Danarnava, the chalukya ruler. It says that kakartya Gundyana was the great grandson of Gundiya Rashtrakuta. Eriya Rashtrakuta was the son of Gundiya, and Betiya was the son of Eriya. Danarnava occupied the vengi kingdom with the help of Krishna-Ill of Rashtrakutas. In exchange for the help of Rashtrakuta army chief Gundyana and to please him, Danarnava donated the village of Magallu (Agraharam) to a Brahmin, and issued the Magallu inscription. The Bayyaram tank inscription, which was issued in 1250 A.D. by Mylamba, younger sister of kakati Ganapati, also says that kakartya Gundyana and others were ancestors of the Kakatiyas; founder of their dynasty was Venna Bhupati; and that his family heirs were the kakatiyas. 1.’Prataparudra yashobhushanam‘, written by vidyanatha explains that the meaning of ‘kakati’ is Durgasakti; as their family worshiped her, that is why they were called as kakatiyas. 2.The people of orugallu worshiped local god­desses called ‘kakati’ and ‘Ekaveera’; a temple of ‘Kakatamma’ was located in the orugallu fort and thus kakatiyas got their name from the goddess- ‘Kreedabhiramam‘ written by vallabhamatya nar­rated the above. Many inscriptions described kakatiyas as the worshippers of ‘Swayam Bhudeva’. As the Bayyaram inscription says, kakatiyas served as the army chiefs of Rashtrakutas in the beginning. They used to participate in the attacks of Rashtrakutas on vengi chalukyas. They used the picture of ‘eagle’ (Garuda) as their official symbol, denoting the subordinate ruler status. But later, when they became famous and changed allegiance to kalyani chalukyas, they used the picture of ‘pig’ (varaha) as their official symbol. The kakatiyas were mentioned as descendants of Surya or chandra dynasty kings; kshatriyas and worshippers of’Swayam Bhudeva Paadaalu’ (feet) in some inscriptions. In Kanchi, Pakala and Motupalli inscriptions were issued by him, kakati Ganapatideva described their dynasty as the descendants of surya (vamsa), and also that they belonged to Manu, Ikshvaku and Mandhara dynas­ties. But the ‘Vardhamanapura’ inscription issued by Malyala gundaya Senani says that kakatiyas were ‘Sudras’. The reign of kakatiyas was described as the ‘Golden era’ of sudras. Kakatiyas followed Jainism earlier arid later converted to Saivism. Vengi chalukyas, who ruled the Andhra coasts, and Rashtrakutas were enemies from the beginning. Rashtrakutas conducted several attacks on vengi chalukyas. Kakatiyas served as the army chiefs of Rashtrakutas earlier; later became subordinate rulers of western chalukyas; still later declared themselves as independent rulers; defeated several local ruling dynasties and had become independent rulers of the whole of Telangana. Gundaraju, fourth generation descendent of kakati vennamaraju, served Krishna-II of Rashtrakutas; attacked the kingdom of Vengi/Eastern chalukyas; and died at battle in the hands of ‘Irumarti Gundana’ son of Bhimavengi chalukya king. In exchange for his services, Krishna-II of Rashtrakutas appointed Eriya, son of Gundana as the ruler of koravi region (Khammam and Warangal areas), which was occupied by Rashtrakutas from Mudigonda chalukyas. Betaraju succeeded Eriya as the ruler of koravi region but due to his weak rule, Mudigonda chalukyas reclaimed it. After Betaraju, Gundana-IV had become the army chief of Rashtrakutas. He was also called as ‘kakartya Gundiya’. Meanwhile, due to internal struggles in vengi kingdom, chalukya Danamava fought and defeated his younger brother Ammaraju-II, with the help of Rashtrakuta ruler krishna-III and ascended the throne of Vengi. In the above battle, he was helped by Gundiya, army chief of krishna-III; in exchange for the support, he donated the Magallu village to please Gundiya and issued the Magallu inscription in 956 A.D. Gundyana-IV was described as ‘Pindigunda‘ in the Bayyarairi inscription. Gundyana helped Danamava later also and had become the ruler of Natawadi region. During this period, revolts occured in Rashtrakuta and vengi politics. Tailapa-II re-established the chalukya dynasty by defeating Rashtrakutas after the death of Krishna-III. In vengi, Jatachoda Bhima ascended throne after killing Danamava. Kakartya Gundyana took advantage of this political chaos and declared independence; attacked and defeated Mudigonda chalukyas and recaptured ‘Koravi’ region (located in Warangal dt. at present), which once was ruled by his father. Mudigonda chalukya ruler Bottu Betha took the help of Tailapa-II of kalyani chalukyas. to defeat kakartya Gundyana. Tailapa, with the help of his army chief Viriyala Errana killed Gundana in battle with this, the his­tory of kakatiya dynasty might have been over if not for an interesting twist here. ★ According to inscriptions, the early native place of kakatiyas was kakatipur. ★ According to Bayyaram tank inscription, as the founder of the dynasty, vennama raju ruled from kakatipur, they had become kakatiyas. ★ ‘Prataparudra yashobhushanam’- says that ‘kakati’ means Durgasakti; and as the wor-shippers of that goddess, they become kakatiyas. ★ Vallabhamatya wrote in his ‘kreedabhiramam’ that there used to be a kakatamma temple in the orugallu fort. Betaraju-I ruled the Anumakonda region for 30 years as the subordinate/feudatory king of western chalukyas. The region of Anumakonda was a part of Warangal and Karimnagar districts of today. ‘Sanigaram’ inscription (1051) says that Betaraju lived upto 1051 A.D. Sanigaranf (Karimnagar dt.) was a place in the Vemulawada chailukya kingdom, arid It was occupied Betaraju, according to the inscription. Recharla Brahma, army chief of Betaraju, attacked Kanchi, capital of chola kingdom, on behalf of Trailokya Someswara, chalukya king. Betaraju also participated in this attack, as his title- ‘Chola chamoovardhi Pramadhana’, sug­gests. He also had another title ‘Kakati Puradhinatha’. Prolaraju-I, son of Betaraju, succeeded his father as the ruler of kakatiya kingdom. Prolaraju befiiended Someswara, the western chalukya ruler and helped him in his battles with chakrakuta kings. In exchange for this someswara gave over the Anumakonda region improper written form to Prolaraju and also allowed him to produce his coins and to use the Varaha (pig) symbol (official symbol of kalyani chalukyas). Prolaraju-I had a title called ‘Ari gaja kesari‘. He was a lover of battles and also a great ruler. He dug many tanks like ‘Jagat kesari samudram, provided irrigation facilities and worked hard for the development of agriculture. He also had the title- ‘Samadhigatha Pancha mahasabda‘. After Prolaraju, Betaraju-II ascended the throne of kakatiyas. By then a political crisis was brewing in the western chalukya kingdom. After someswara, his sons-someswara-II and vikrama- ditya-VI fought for the throne, in which Betaraju-II supported Vikramaditya-IV. As Vikramaditya won and came to rule, he honoured Betaraju with the titles ‘Vikrama chakri’ and ‘Tribhuvanamalla‘, and also permitted him to occupy sabbi mandala (Karimnagar dt.) and Mudigonda region (Khammam), which were bordering the Anumakonda area. Betaraju had a right haridam named ‘Vaijya’ who was very wise strategist. With his tactics Prolaraju could occupy the sabbi man­dala. The khazipet inscription praised betaraju-II as a great warrior and was like a lion to the rulers of chola and Malwa dynasties. Betaraju-II converted to saivism by the preaching of Rameswara Pandita, who was a kalamukha saiva Acharya. He built the saivapur at Anumakonda as a present to his teacher (Guru) and also the Beteswara temple. He built sev­eral shiva temples in many other places. Durga Nripati, eldest son of Betaraju-II suc­ceeded his father and ruled for 8 years. He took two titles “Tribhuvana malla’ and ‘chalamartiganda‘. According to khazipet inscription, he made many donations in the name of his religious teacher, Rameswara Dikshit. After the death of Durganripati, his younger brother Prolaraju-II came to rule in 1116 A.D. He had an important place among the early kakatiya rulers. The Hanumakonda inscription issued by his son Rudradeva and Ganapavaram inscription issued by Ganapamba describe the many battles he fought and regions he won. Prolaraju-II defeated Jaggadeva, Padamara leader of kolanupaka and his friends Medaraju and Gundaraju, polavasa leaders. He also defeated Tailapa, younger brother of someswara-III of kalyani chalukyas, at kolanupaka and kandur sent him-back to his capital kalyani under military supervision. After the defeat of Tailapa, kandur choda Bhima went into underground, prolaraju caught Gundaraja in Manthena, shaved his head and killed him. He also defeated other subordinate kings of western chalukya kingdom in Telangana and strengthened his dominance. Later he went to Srisailam and worshiped lord Mallikarjuna. Afterwards, he went an an expansion spree towards the krishna and Guntur regions of coastal Andhra. Rulers of that areas, led by Bodharaju fought with prolaraju-II. In that battle, Prolaraju was defeated by Bodharaju and his son Gonkaraju. The Draksharama inscription reveals that prolara­ju died in the hands of Bodharaju. Prolaraju-II married Muppamamba, sister of Durgaraju, Natawadi ruler. He had 5 sons, namely-Rudradeva, Mahadeva, Harihara, Gpnapati and Durgaraju. After the death of Prolaraju-II, his eldest son Rudradeva came to rule. He was also called as prataparudra-I. He was a greater ruler than his father. He continued his father’s expansion spree and extended the kingdom from the level of subordi­nate rulers to an empire. He defeated all the non-Andhra rulers in the Andhra region and united it. The upparapalli inscription of Ganapatideva and Malkapur inscription of Rudramadevi reveal a lot of details about Rudradeva. By the time Rudradeva came to rule, the west­ern chalukya empire was in chaos. Tailapa-III occu­pied some parts of western chalukya empire from under Jagadeka malla. But kalachuri Bijjala took the power of Tailapa-III in a coup. In the middle of this chaos, Rudradeva, declared independence as he did not want to be a subordinate to any of the above. Meanwhile, Bijjala wanted to restore the place of western chalukyas in Telangana and came out of underground. Rudradeva, with his army went to Polavasa to attack its leader Medaraju. Medaraju could not fight back against Rudradeva and fled into forests crossing river Godavari. Bijjala, who joined hands with Medaraju to fight against Rudradeva, also withdrew. Rudradeva sent him back upto Kalyana Katakam. He gave the details of this battle in the Anumakonda inscription. In all these victo­ries, a minister called Gangadhara helped Rudradeva. In exchange for it, Rudradeva made him the ruler of Sabbi mandala. With the above victories of Rudradeva, the rule of kannadigas (since 7th cen­tury A.D.), on the Andhradesa, ended. For the first time after the origin of Telugu language, the first independent Andhra kingdom emerged. After the death of Tailapa-III, the western chalukya ruler, like kakatiyas, yadavas also declared independence and made Devagiri as their capital. They maintained enmity with kakatiyas. Yadava king Jaitugi or Jaitrapala who ruled between 1191 and 1210 A.D. was a war lover. He invaded the kakatiya kingdom in 1195 A.D. while Rudradeva was away at coastal Andhra, expanding his kingdom. Later in this battle, Rudradeva was killed. Rudradeva was not only a great warrior, but also a great patron of arts. He loved literature, and arts. As he was a worshipper of lord shiva, he built the Rudreswara temple (Thousand pillar tem­ple) in Hanumakonda with the idols of lord Rudreswara, Vasudeva and suryadeva. Rudradeva himself was scholar and poet. He wrote a book called ‘Neetisara’ in Sanskrit, Patronised great poets like palkuriki somanatha. He built some parts of the town of orugallu according to his artistic tastes and transferred the capital from Anumakonda to orugal­lu partially and thus laid foundations to the new capital. As Rudradeva had no offspring, his younger brother Mahadeva ascended the throne of kakatiya kingdom. His details are revealed through Pakala, Ekatrakanatha, Kandavaram, and Malkapuram inscriptions and the book-‘Prataparudra Charitra. His reign was not significant in the kakatiya histo­ry,’ though he invaded Devagiri, capital of Yadava kingdom, to take revenge against Jaitugi for killing his brother Rudradeva. Mahadeva died during this battle and his son Ganapatideva was imprisoned by Jaitugi. Mahadeva had a son-Ganapatideva and two daughters – Mylamba and kudambika. To protect the kakatiya kingdom, he gave his two daughters in marriage to Rudra, son of Natawadi ruler, Buddhadeva. The rule of Ganapatideva started with a crisis. His father Mahadeva died in the hands of yadava ruler Jaitugi and he was imprisoned. With this anar­chy prevailed in the kakatiya kingdom. Recharla Rudra, army chief of Mahadeva saved the kingdom from complete ruin. While he was conducting the administration of the state, Jaitugi came to know about the courage and talents of Ganapatideva and released him from the prison and handed over the kakatiya kingdom, according to the inscription of yadava ruler Ramachandra deva. Though Ganapati­deva ascended the Throne in the middle of negative conditions, he was a good ruler and expanded the kingdom further. After the Satavahana dynasty, Ganapatideva was the only ruler who brought the whole of Andhradesa under single dynasty control in the history of Telugu regions.